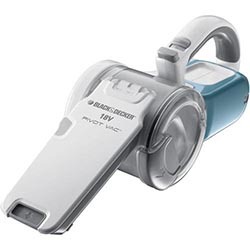 Black and Decker’s PHV1810 18V Cordless Pivoting Hand Vacuum has a modern, unusual shape for a hand vacuum. It’s unique in that it can change its very shape while you clean – but number one, how helpful is that, really? And two, how does it affect its performance? Let’s explore the ins and outs of the Pivot Vac and find out. Regardless of changing shape, with 18 volts the Pivot Vac is already off to a strong start. That kind of suction makes it comparable to larger stick vacuums…assuming that its pivot feature doesn’t interfere with it putting that power to use. Fortunately, Black and Decker’s design seems to have held true in that regard. Even with this vacuum’s suction spread over a wide mouth, it’s noticeably strong. Many other handhelds need a small opening to have good suction, so it’s a testament to the Pivot Vac’s power and suction that it doesn’t need to resort to that, and it makes cleaning easier. Here’s where we’ll really get into the pros and cons of this vacuum’s ability to transform. It is very helpful to be able to rotate the nozzle around corners and to get under and behind furniture, and moreover the vacuum can fold entirely in half for easy storage. It’s actually pretty innocuous like that – it looks like just another gadget sitting on the counter. The only issue with the pivoting is that there’s a chance dust might fall out when you do go to fold it up for storage, which can be a little frustrating when you think you’re done with cleaning. The Pivot Vac uses a NiCad battery. Which is good because it makes for a cheaper overall cost, but is not so great in requiring a full day to charge and in having a less than ten minute runtime. Of course, handhelds don’t usually require a longer runtime given how they’re used in such short spurts usually. At about six pounds, the Pivot Vac is pretty heavy. I mean, six pounds isn’t too bad to carry around, but on the same token it’s just as heavy as some stick vacuums. Black and Decker decided to go with the traditional three-stage foam and paper filter for this vacuum – it’s not the best, but it does keep cost down. They did design the Pivot Vac so that if you rotate the dust bin it helps flick dust off the filter, which is a boon because the filter can be hard to take out to clean. The Pivot Vac’s circular dust bin is 16.9 ounces – that’s a good, solid size for any cordless vacuum, especially a handheld. Like many modern vacuums, the Pivot Vac has gone the route of integrating what would otherwise be included (and easy to lose) accessories into the vacuum itself. Thus, you can flip down a brush for dusting and delicate surfaces, or extend a crevice tool from the vacuum’s mouth to get into furniture or automobile cracks. Sadly, while the majority of people I know of who have this vacuum don’t have any issues, it sounds like the Pivot Vac has had some battery issues since it’s been released. In the same token, Black and Decker has great customer service, so if you happen to get one of the duds it should be taken care of pretty quickly. The Pivot Vac’s two year limited warranty is par for the course for cordless vacuums, and it’s a vote of confidence for the battery lasting at least that long. Considering the unique pivot feature and strong suction, the Pivot Vac sells for an outstanding price, offering just as much in those regards as much more expensive handhelds. The Pivot Vac has both some quite strong points in its favor and a couple possible faults that do need to be considered. If you want a powerful handheld vacuum that’s versatile to the point of being able to change its shape for different environments at a hugely affordable price, then go with the Pivot Vac. Just keep in mind, there’s a small chance there might be some issue with the battery…but in balance, I’d say that relatively tiny gamble is worth it.